Are you a singer, soloist or in a duo, trio, live band, group or tribute act? Click here to register with AMPband. Membership includes £10m PLI. If you are now ready to use our free service (with no obligation) Click Here. Our members will then contact you directly and you can decide. The Easy Way to Contact Live Acts - Fast! This site will put you directly in touch with live bands, singers and tribute acts in your area with just one click. Click your area on the map, narrow this down to your locality on the next page, tell us a few details about the function or event you are planning and our members in your area will contact you directly. UK-Band in association with the Alliance of Musicians & Performers [AMPband] makes it easy to find the ideal live act for your event - and it's really quick too! 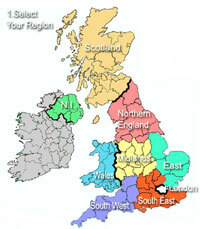 So to start your enquiry simply click the map (top right) or go to a larger map here. This is a free to use service and you are not under any obligation to book. UK-Band is designed to save you lots of time searching for your ideal live act, singer or tribute act - we do the hard work so you don't have to. Use the map above, the links (top) or these larger maps to select your area. Then complete the short enquiry form. Singers, musicians & live bands in your area will contact you directly.